If you’re looking for an AMAZING Fat Free Vegan Marinara Sauce – your search has ended! 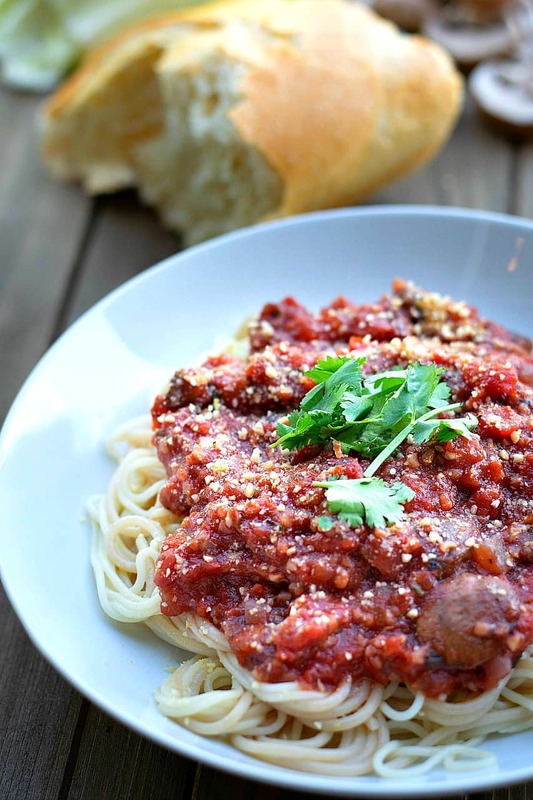 Say goodbye to store-bought spaghetti sauce forever! You know – that overpriced stuff that is usually nothing but cheap tomato sauce, lots of oil, and salt? Oh, look! A clove of garlic! Yeah whatever…. 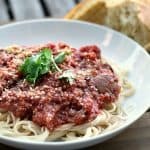 This Fat Free Vegan Marinara Sauce is absolutely divine, completely oil-free, and so easy to make with common ingredients from your pantry. And it’s versatile enough to use not just on pasta, but also as a dipping sauce for breadsticks or even as a pizza sauce. Oh man. Like nothing, you’ve ever got out of a jar before. Let’s just say I made a batch of this the other night and my 18-month-old grandson devoured it. And he’s a picky eater. Did I mention there’s no oil or added fat ??? And with hardly any sodium, strange chemicals OR preservatives….. you’ll never buy those overpriced jars of store-bought sauce again. Start by dicing your onion and bell pepper uniformly in size and sautéing them in a large pot until softened. Use a tablespoon of veggie broth or water to keep things from sticking. Add some sliced mushrooms and let those shrink down a little. Finally, add the garlic and let that simmer until any liquid that’s left has all but cooked off. Now add the wine and give your sauce a good stir. Let that cook for a minute or two and then add all the remaining ingredients. Mix well and simmer on low heat for 20-30 minutes. If the sauce seems too chunky, you can always use an immersion blender to get the consistency you like, or simply blend a cup or two in your high-speed blender and then add it back in. Mmm…. nothing like homemade spaghetti sauce, just like mama used to make…..well – without the oil. 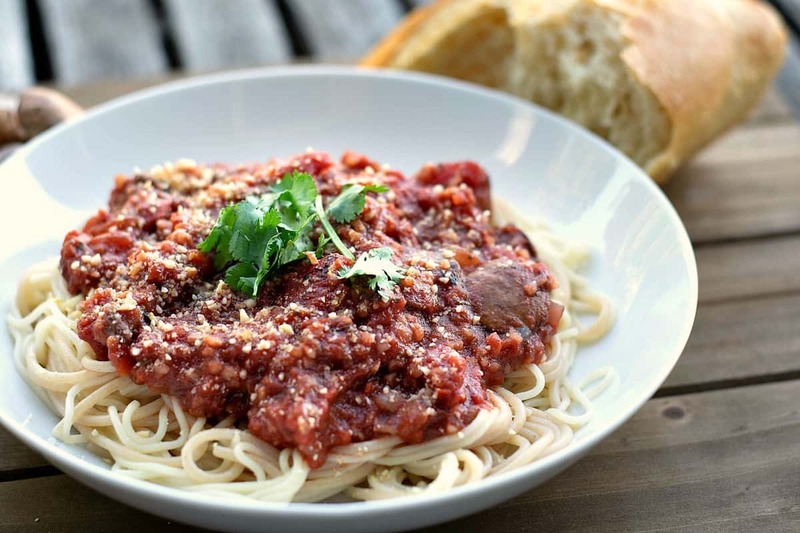 A quick and easy sauce that is thick, rich, fat free, low sodium, and has no strange chemicals or preservatives – you’ll never buy those overpriced jars of store-bought Marinara Sauce again. Finely dice the onion and bell pepper to a uniform size. Sauté all the veggies together in a saucepan, just until they soften. Use a tablespoon or two of veg broth or water to prevent sticking if needed. Add the sliced mushrooms and continue cooking until they have reduced in size and released their liquid. Stir in the minced garlic and continue simmering for 1 minute or until fragrant. Add the wine and stir to combine. Cook for 1-2 minutes. The wine adds a very elegant flavor to the sauce, but can be replaced with veg broth if necessary. Add the tomatoes and tomato paste and mix thoroughly. Add the remaining seasonings and simmer uncovered on low heat for about 30 minutes. The brown sugar is optional but helps reduce the overall acidity. If the sauce is too chunky for your liking – you can use an immersion blender or....blend a cup or two, to get the consistency you like. If you have a Food Processor it will make a quick chore out of chopping all the veggies. Since I added the can of Fire Roasted Tomatoes with their juice (and sodium) - I did not add any extra salt. Feel free to adjust the seasonings to your own individual taste. There are no canned roasted tomatoes available where I live. I think I’d just use two cans of the normal ones. I’ve never seen a marinara sauce recipe that used white wine. Only red. Does it make a difference taste-wise? I don’t think it really matters but remember, the larger the chunk size (whole tomatoes vs diced) the longer it will take to break down. Or just put them in a blender first. Also – if using regular tomatoes the sodium content will be pretty high so you may want to drain them first. Try stewed! I have not tried Red Wine yet just the white. And I really can’t taste it anyway – I think it just adds depth. Try the red and tell me what you think…. I can’t wait to try this recipe! Just be careful with the Moscato as some contain high fructose corn syrup. Isn’t it sad that we have to read the ingredients labels on wine? Thanks Jean! Will definitely keep that in mind! Enjoy the recipe – I actually make this a lot! If you ever try the lasagna recipe – this is the same marinara I use. I really love your website!! Awesome recipes … Thank you!! Could you tell me what I could use as a sub for the white wine? Thank you! Buy tomatoes in bottles, not cans. Can you name brands of bottled tomatoes for this recipe? Can’t wait to try this one, Chuck! Looks delish! I love this sauce so much I ate a bowl like soup, much to to the embarrassment of my two teenaged stepkids! This also works nicely as a pizza sauce if you really boil off the water for a thicker consistency and blend until smooth. We forego the white wine due to family taste preference and the sauce still tastes great. It’s easy to make double or triple batches and freeze the extra for quick dinners. Thanks, Chuck! 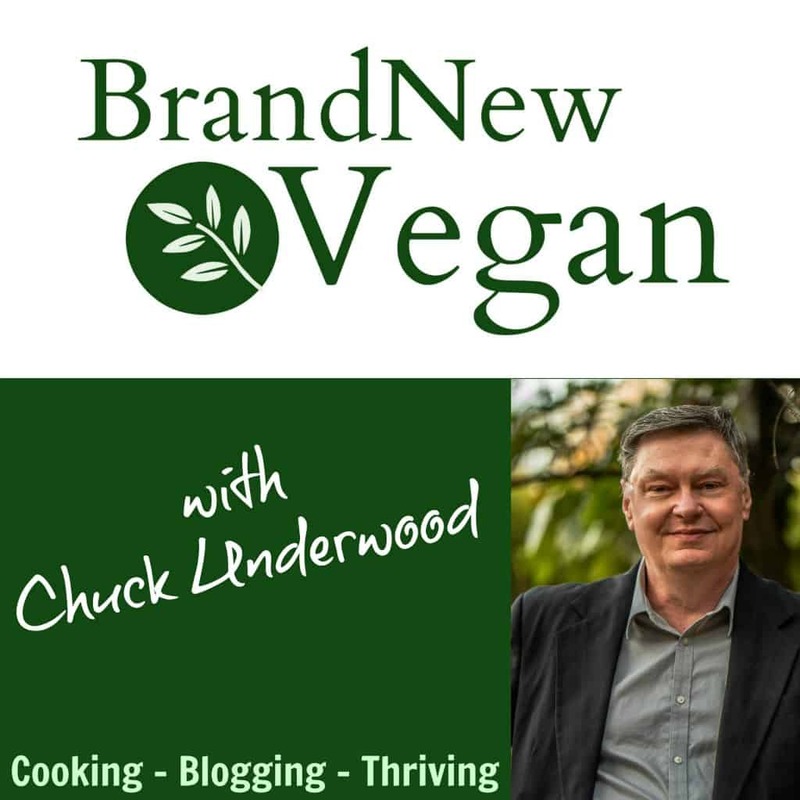 I just discovered you today – you are an amazing vegan chef – THANKS! I made a triple batch of this marinara sauce in my crockpot, yesterday. It made the whole house smell amazing and it’s delicious! I made it exactly as written. I used to buy 365 brand pasta sauce from Whole Foods (no oil) but this is so much better. Thank you for sharing this great recipe! Making this right now……….looks yummy! A trick I learned from being married to a Sicilian guy – add shredded carrots to your sauce. They are sweet, and will allow you to greatly reduce or eliminate the sugar. Also, Balsamic vinegar helps to sweeten and add depth to the flavor. Does this recipe make about 4 cups…. or more? An absolutely delicious marinara sauce, it has become a staple. My son requested spaghetti for his birthday supper today and I remembered seeing this sauce recipe not too long ago. It is currently simmering on the stove and I’m going to have a hard time staying away until this evening. It is unbelievably delicious. Thanks for the recipe! Chuck is the wine cooking red wine or the red wine like you would drink? Never cook with wine that you wouldn’t drink. This is a great spaghetti sauce! Thank you for another good recipe. Found your site today looking for my first seitan recipe. I like this recipe, but a word of caution. Not all wines are vegan. Many use fish bladders to filter their wine, therefore, not vegan. The same may be true about the red wine vinegar. If practical, get wine and wine vinegar that is certified vegan, you may have to ask the store clerk or manager, or see if they have Vegan wines at your local health food store, or sell it online. Hi Chuck ~ I made this yesterday and it was SO good! Thank you for the wonderful recipe 🙂 I served it over raw zuchini noodles. I made a double batch so that I can have some to freeze for future meals. This is a very good sauce!!! The 2nd time I made it, I put less than 1/4 cup of red wine (Cabernet Sauvignon) instead of 1/2 cup and used 4 cloves of garlic instead of 2. Also, I used a garlic press instead of mincing it. Those adjustments balanced everything out just right.. Thanks for the post. Wow. Made a batch using my fresh tomatoes and the fire roasted tomatoes. I liked it so much I made two more batches for the freezer. Thanks for sharing your WFPB recipes. A pinch (and I mean just a pinch) of baking soda takes down acidity immediately. I use it in all my tomato sauces. It really works but seriously, start out with less than 1/8th of a teaspoon. It will fizz but after mixing it in it will reduce the acidity and add a bit of sweetness and balance to the overall flavor.